Ever since our volunteers heaved the dead tree down the slope and onto the lake bed it has been a favourite perch for some bird or the other. Mostly though, it was only for mynahs and a stray kingfisher. Some days ago, our gardeners set the tree upright and planted it firmly in the ground, well above the water mark. 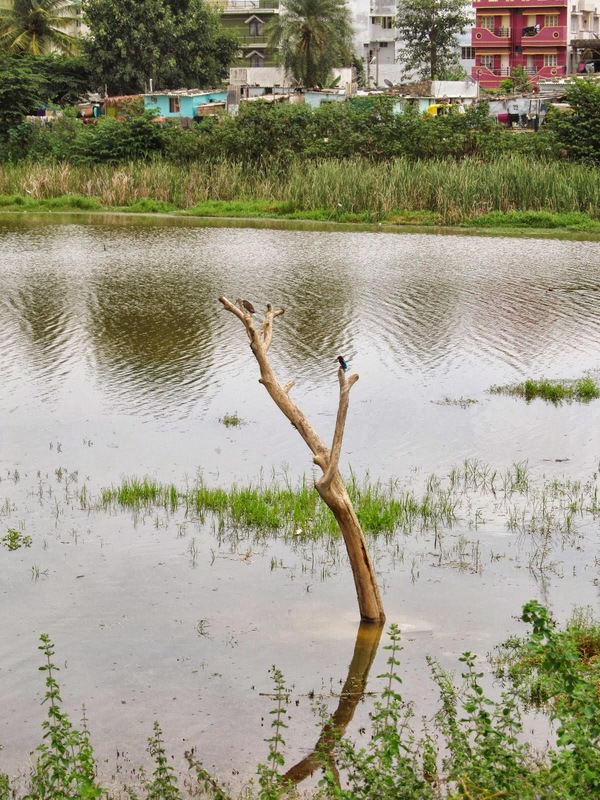 In the recent downpour, however, the level increased to such an extent that the dead tree was exactly as we had wanted it to be - in a foot or more of water. Since then it has become a perch for Little Cormorants, Pond Herons and the Kingfishers. On 8th Oct. at about 4 p.m., I spotted a new bird on the tree. It was about the size of a sparrow, with a grey crown and shoulders and a maroon back. Its wings and long white tipped tail were black while the underparts of the body were white. A bold white patch on sides heightened the striking colours of the bird. What was it? The black bandit like band over its eyes was a give away. I knew it had to be a Shrike but which one? I called Mr. Gopinath an avid bird watcher who from childhood has been keeping a record of every new bird he's seen, time and location. I described the bird that so obligingly sat on the tree, turning this side and that side like a model at a photo shoot. Mr. Gopinath said, "Wait. I'll come." That's fine but what if the bird flew away by then? Mr. Gopinath came by car with camera and bird book in hand and we began walking towards the dead tree. Just then OPR spotted a water snake zooming towards the nest of a Common Coot. Mr. Gopinath captured the drama of the snake evading the coots, the chick escaping the predator, the coots finally chasing the snake in the water. As we feared, by this time the bird had flown away and all that we saw were the bare branches. I'd taken fairly decent shots of the model bird and we sat on a bench nearby to identify it from Mr. Gopinath's bird book. It was without doubt a Bay-backed Shrike he declared and looked up. There was the bird sitting on the tree once again! Subsequently we found out that it is not easy to spot the Bay-backed Shrike in an urban setting. It feeds on small birds, lizards and rats which are normally found in open countryside, thorny jungle and cultivated areas. It so happens that to the right of the dead tree is the highest (and driest part) of the lake overgrown with wild shrubs and bushes. We have rued the elevation here which prevents water from covering the ground but not any more. 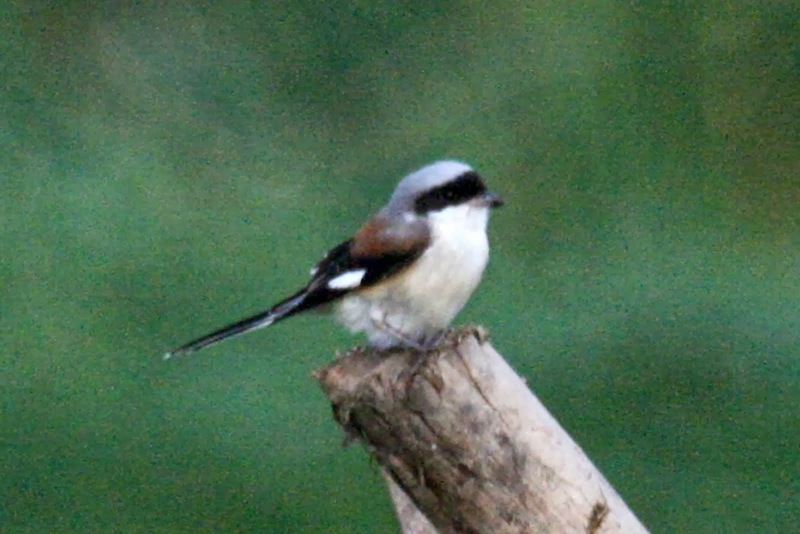 We have the best of both elements at our lake - water birds and the Bay-backed Shrike. Lesson I learnt - always go to the lake with a bird guide. Happy bird watching to all.